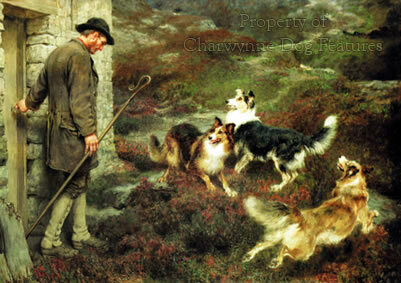 In his The Twentieth Century Dog of 1904, Herbert Compton quotes a contributor who writes: “The sheepdog trials cater for the working dog, which, by the way, is generally a nondescript cross between the Old English sheepdog, the lurcher and the collie. I myself cannot fancy a £1,000 dog working sheep! Although Ormskirk Charlie, a pure-bred rough collie, was a champion sheep-dog trailer, and Emerald Mystery, by Ormskirk Emerald, is also a first rate one; and there are others. I believe I am correct in stating that the highest price ever paid for a working field-trial sheep-dog is under £200.” In 2013, a Border Collie went into the record books after being sold for nearly £10,000 at auction. The previous record was £8,400 in 2012. The dog’s owner, John Bell, bought him as a 13-week old pup for £315; this dog was Mr Bell’s third record-breaking sale in three years. Sheep farmers in the United States, where this dog was destined to work – and be bred from, no doubt, clearly realize the value of the working sheepdog to their profession. There are just under 20,000 pastoral breed registrations each year with our KC, if you include the few breeds they choose to group as Working Group breeds despite their clear pastoral role. If each pup is worth around £500, that represents a substantial turn-over, with the suddenly-popular breeds vulnerable to exploitation by wallet-led breeders with little interest in quality or the welfare of the pups. The coats of Bearded Collies, Hungarian Pulis and Old English Sheepdogs need regular and committed care. Border Collies can be so hyperactive and intense in attitude that they do not make good urban pets; those bred specifically for strong fly-ball energy can be too demanding for suburban families. Those bought from farms can end up with a massive work ethic but no outlet, not a good scenario for a family pet. The International Sheepdog Society (ISDS) registers several thousand dogs each year; whilst these are bred to be working dogs, many end up as pets. Their worth as a pet may be different from their value as a working dog. The good qualities in a working collie aren’t exactly those expected of a companion dog and care is needed to ensure that the purchase of a pastoral dog is suitable for both owner and dog. 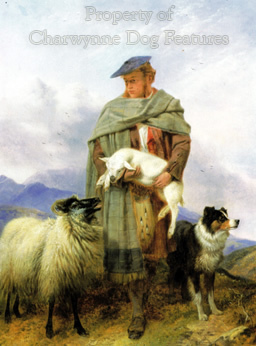 In her charming and beautifully illustrated Rural Portraits – Scottish Native Farm Animals, Characters and Landscapes of 2003, Polly Pullar writes: “Though I am filled with awe while watching the magnificent dogs and their handlers that win trials…it is the good old-fashioned farmyard collie that fascinates me the most. Many of these stalwarts of the farming community are often much-maligned…Many under-worked dogs are far too keen…they end up rounding up everything within a mile radius of the homestead…A collie is only ever as good as its handler. But all too often this basic fact is overlooked, and the dog is shut away and tagged as useless, manic, stupid or impossible to train. Bad workmen always blame their tools.” Sheepdogs are generally seen as hardy and valued by shepherds, but a 1953 survey in Scotland revealed that at least 11% were suffering from Black Tongue as a direct result of inadequate diet. These dogs were expected to run or walk 90 miles a day at lambing time and had to have protein, not just their diet of oats, if their health and stamina were to be maintained. Every ‘employer’ should value the ‘staff’! Despite being able to trace its ancestry back to the native sheep dogs of Thuringia and Wurtemberg, I believe it is fair to state that the GSD has ceased to be a pastoral dog and should now be regarded as a service dog. I believe it is also fair to state that for a century at least it was the most widely-used service dog in the world. That is some tribute to the early breeders. It is not any solace to the breeders of today however to see that retrievers, purebred and crossbred, are replacing the GSD as guide-dogs, the police in many European countries are turning towards the Malinois for their needs, with spaniels being preferred for drug, contraband and bomb-search work. The ubiquitous Border Collie is emerging as the best-equipped, all-round, multi-purpose service dog, mainly because of its biddability and wide-ranging natural talent, but also through its physical robustness, which means lower maintenance costs for the user. The harm done to the GSD breed by misguided faddists is incalculable. 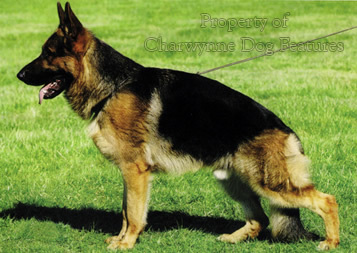 In their important book on the breed, The Complete German Shepherd Dog of 1983, Nem and Percy Elliott wrote: “The breed definitely went wrong of that there is no doubt. To get things back on an even keel, is what’s necessary, i.e: back to the balanced dog, of correct type. For some that is not enough. They wish to continue to exaggerate their breeding plans; but in the opposite direction! Consequently, there are those who wish their dogs to be shorter than normal, with sloping and raised backlines, half-starved during puppyhood so as not to be too heavy; and this is equally wrong. Those of us with the necessary experience, have to continue to try and guide the development of the breed on the right lines. I think we shall succeed, but time will tell.” This makes sad reading and I wish them and their enlightened colleagues eventual success. No farmer could afford to breed deformed dogs! 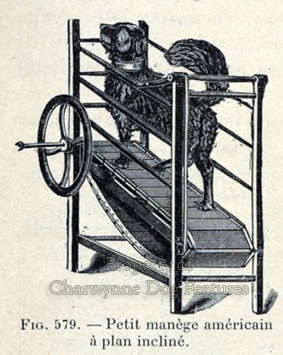 Dogs working in harness have served man for centuries, whether hauling sledges, carts, loads on poles - dragging them over the surface, or turning treadmills, early agricultural machines or such like. 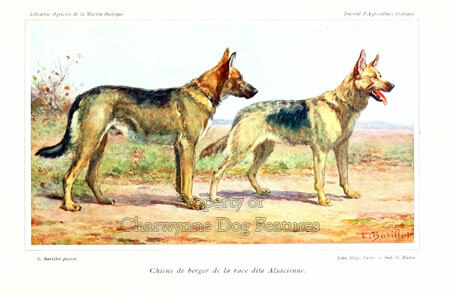 Their contribution was unique in Europe and the value of the dogs was long acknowledged. Just over a century ago, Professor Reul, one of the founders of the Belgian Club for Draught Dogs, wrote: "The dog in harness renders such precious services to the people, to small traders and to the small industrials (agriculturists included) in Belgium that never will any public authority dare to suppress its current use." Taplin, writing in The Sportsman's Cabinet of 1804 on Dutch dogs, stated that: "...there is not an idle dog of any size to be seen in the whole of the seven provinces. You see them in harness at all parts of The Hague, as well as in other towns, tugging at barrows and little carts, with their tongues nearly sweeping the ground, and their poor palpitating hearts almost beating through their sides; frequently three, four five, and sometimes six abreast, drawing men and merchandize with the speed of little horses. 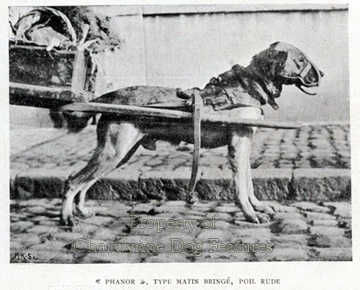 Draught dogs were not only cheaper to employ than horses but were much more manoeuvrable. Importantly too, their drivers were not required to pay tolls. Despite this, the use of dog-carts was never widespread in Scotland, perhaps because of the long distances between towns. 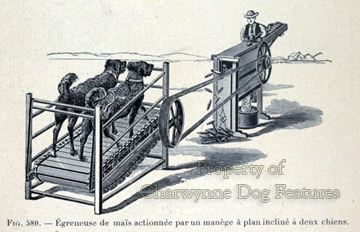 When the railways came, dog-drawn carts were used in the south of England to carry fish from the ports to the railheads. Some made the journey from Brighton to Portsmouth in one day, returning the following day. Humanitarians argued that dogs' paws were never designed to cope with hard sharp-stoned roads, whatever their widespread and indispensable use over snow in Arctic countries. But no one disputed the value provided by the dogs. Some critics suggested that dog-carts frightened horses and vets even cited such use as a means of spreading rabies! The use of dog-carts in England was ended by piecemeal legislation. In 1839 a clause in the Metropolitan Police Act denied the use of dogs as beasts of burden within 15 miles of Charing Cross. This alone resulted in the destruction of more than 3,000 dogs. When an anti-dog cart bill was being introduced in 1854, the Earl of Malmesbury stated that in Hampshire and Sussex alone there were 1,500 people earning a living from dog-carts. In the debate, Lord Brougham spoke of a dog-cart driver who had ripped up an exhausted dog and given its entrails to two other dogs for food. 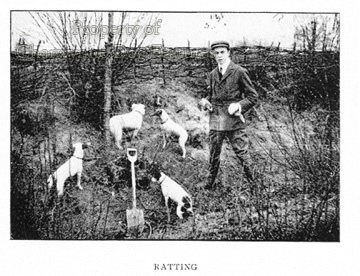 The Earl of Eglington, opposing the bill, forecast the destruction of between 20,000 and 30,000 dogs. The Bishop of Oxford stated that ill-used dogs had been traced for distances of up to 20 miles by following blood trails on the highway. He claimed that it was not unusual for a dog to be driven 40 or 50 miles on a hard road until it could just not continue, when it would be destroyed and replaced by a fresh dog. The bill went through. ." In British cities, draught dogs were widely used, until, because of the huge increase of traffic in London, compounded by the widespread ill-treatment of the dogs, led to this practice eventually being forbidden by the law, as outlined above. But the value of the 'cart-dogs' before being overtaken by powered traffic was inestimable. The value to man of dog's scenting powers is still being underestimated. Perhaps the gr eatest failing of man in his understanding of dog is his recurring inability to appreciate how dominant in the senses of the domestic dog is the sense of smell. For man the main detecting senses are sight and hearing, indeed I have read scientific papers claiming that our sixth sense only lapsed because of the high quality facility given to us by our eyes and ears. I have also read articles in country magazines extolling the superb eyesight of dogs, which I find hard to justify. I have never come across a dog with better all-round eyesight than man, although we will never be able to match their remarkable detection of movement. Never too will any of us ever match the quite astonishing sense of smell in dogs. The more perceptive writers on dogs have long appreciated the overriding importance of the canine sense of smell. Wilson Stephens in his quite excellent "Gundog Sense and Sensibility" has written: "To gundogs, with centuries of nose-consciousness bred into it, noses are for serious business, eyes merely come in useful occasionally"... going on to state that he had never needed to teach a dog to use its nose but usually had to teach one to mark the fall of game using its eyes. The dog's nose assists it in vermin control too, with speed of reaction matching any scenting skill. Rodents are the most abundant order of mammals; 50% of the species of living mammals are rodents. Tough, adaptable, prolific and omnivorous, rodents have posed a threat to man's health and food supply throughout history, from well above the arctic circle to the deserts and humid jungles of the tropics. Some rodents serve as reservoirs for human diseases such as bubonic plague, tularaemia and scrub typhus; it is believed that around 25 million people died from the Black Death in Europe in the Middle Ages. It has been estimated that, without control measures, rats and mice destroy one third of all grain crops. A survey found that one rat consumes 50lb of grain a year and damages twice as much - 150lb a year lost per rat. One farm in Iowa was found to have 1,000 rats per acre. As rats can breed from 33 days onwards, throughout the whole year, they present an enormous threat to man's well-being. Poisoning them can affect their natural enemies too; but it's not enough to hate them, in the end, rats have to be hunted and destroyed. 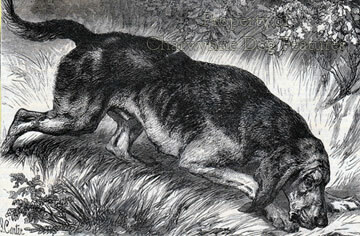 But whether killing vermin and preventing starvation and the spread of diseases, tracking criminals or detaining them, guiding blind people out of doors and aiding them with chores indoors, filling the pot of hungry people, herding and protecting livestock, hauling carts or sledges or detecting diseases in humans through scent alone, the dog gives value. The value of companionship is beyond measurement but it is this value, perhaps ahead of any other, that gives man the greatest reward in a world more lonely for some than ever before.